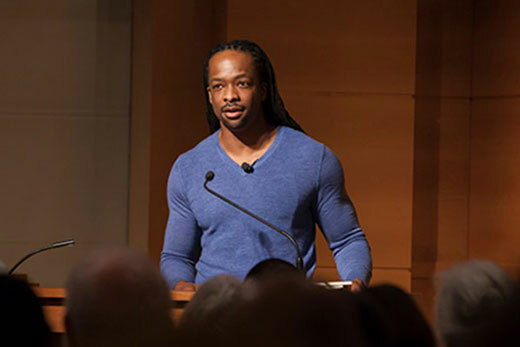 Two poems by Jericho Brown, associate professor of English and creative writing at Emory College of Arts and Sciences, have earned top honors in the Poetry Society of America’s (PSA) 2017 awards. Brown’s poem “Ganymede” won the Cecil Hemley Memorial Award, which recognizes a lyric poem that addresses a philosophical or epistemological concern. The award brings with it a prize of $500. Elizabeth Willis, among a panel of PSA judges, called the poem “a stunning recasting of the classic myth of stolen youth,” in which an adolescent boy is abducted by Zeus and brought to serve him on Mount Olympus. “In examining the choices a reader makes in what he sees and how to name it, the poem turns over the myth's dynamic of betrayal and reward and shakes loose a set of observations that are as contemporary as they are classical,” she writes. In addition, Brown's poem “As a Human Being” won the Lyric Poetry Award, which recognizes writing achievement of a lyric poem on any subject. It also carries a $500 prize. Brown has earned national awards for his poetry collections and critical acclaim for his scholarship, including a 2016 Guggenheim Fellowship. However, he says this marks the first time he’s entered individual poems for consideration in a poetry competition. “I don’t even know how to begin to describe how happy and excited I am,” Brown says. “Artists and poets send our work out into the world with the hope that it reaches an audience and makes a difference,” he explains. “You don’t always expect to have physical confirmation that it’s going to happen. Brown, who is already at work on his next poetry collection, will step into a new role this fall when he becomes the director of Emory’s Creative Writing Program. Recipients of this year’s distinguished PSA awards will be celebrated at the 107th Annual PSA Awards Ceremony, set for March 29 in New York City. Although Brown isn’t the first poet to earn two PSA awards at the same time in the annual contest, a PSA spokesman said that it carries a mark of distinction. The PSA's Annual Awards are among the most prestigious honors available to poets. They offer emerging and established poets recognition at all stages of their careers. The awards recognize everything from a single poem to the PSA’s highest honor, the Frost Medal, which celebrates lifetime achievement in poetry. The nation’s oldest poetry organization, the PSA was founded in 1910 for the purpose of creating a public forum for the advancement, enjoyment and understanding of poetry.